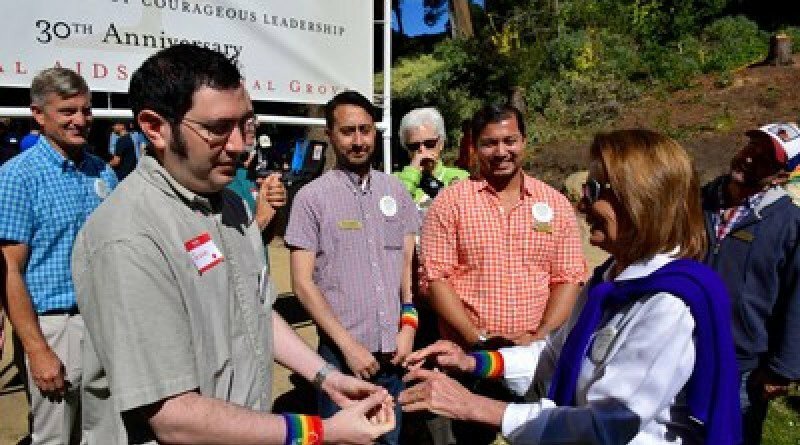 San Francisco’s Congresswoman, House Democratic Leader Nancy Pelosi, joined hundreds of volunteers at the National AIDS Memorial for a community volunteer workday to commemorate her 30 years in Congress. Since her first days in Washington D.C., she has been a leader, champion, and hero on the issue of HIV/AIDS and her avid support of the LGBT community. During the morning activities, Congresswoman Pelosi joined volunteers as they planted flowers, new shrubs, and a tree, in addition to helping maintain the grounds of the Nation’s AIDS Memorial. The event also marked a significant milestone for the National AIDS Memorial as it has surpassed 200,000 hours given by community volunteers to create and maintain the 10-acre living memorial. For the past thirty years, Congresswoman Nancy Pelosi has worked courageously to advance the issue of HIV/AIDS, supporting major funding, research, and programs that have been critically important to the advancements and improvement of the quality of life for those living with the disease. In 1996 she successfully spearheaded the passage of legislation that was signed by President Bill Clinton designating San Francisco’s AIDS Memorial Grove, as a National Memorial. Since the first Workday in 1991, nearly 40,000 volunteers have participated in more than 300 Community Volunteer Workdays, donating more than 200,000 volunteer hours and planting more than 10,000 trees, plants, and shrubs. For more information visit www.aidsmemorial.org, follow on Facebook @NationalAIDSMemorial or @AIDS_Memorial on Twitter. Click HERE for photos and video from the event.